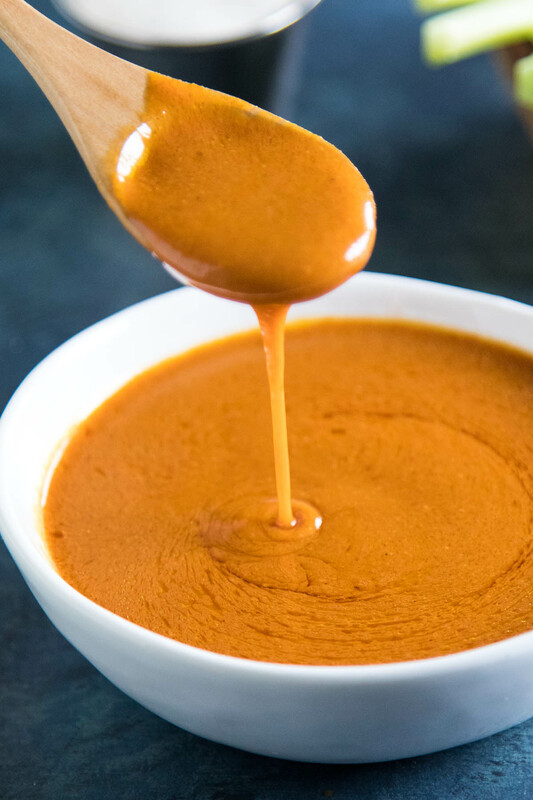 Make your own authentic homemade Buffalo sauce with this recipe with hot sauce, butter, Worcestershire sauce, vinegar and more, and it’s so much better than anything you can grab from the store. I already know you guys LOVE Buffalo sauce. I mean, you’re hanging around Chili Pepper Madness, so that’s a good indication that you’re a chilihead of SOME degree. And that’s a good indication that Buffalo sauce is something you’ve been enjoying much of your life. Instant chilihead. I’m telling you, it’s how it goes. It isn’t a ridiculous scenario. I get Buffalo sauce on my wings all the time when I’m at a restaurant. At home, I like to make it myself. Why? I like mine better. Sure, you can purchase Buffalo sauce from the store, pre-made, but this is fresher and tastier and DANG if it isn’t CRAZY good. I was lucky enough to visit the original Anchor Bar in New York, where Buffalo Sauce originated – it’s in Buffalo, New York – and this is the real deal sauce. Of course I personally like to REALLY spice mine up with ghost powder, but you really don’t have to. That’s a bit crazy, and I don’t always use it, but sometimes I want REALLY SPICY. Sometimes I just want it awesome like it is on its own, as you will see below. Ghost pepper flakes = optional. I’m serious! Only if you like it REALLY spicy. Buffalo sauce is basically a mixture of hot sauce with melted butter. You can (and should) add other ingredients, but that is the core combination. The very definition of a Buffalo sauce. Some people confuse hot sauce with Buffalo sauce. You can use them interchangeably, based on your own flavor preferences. However, they are different because of the butter. 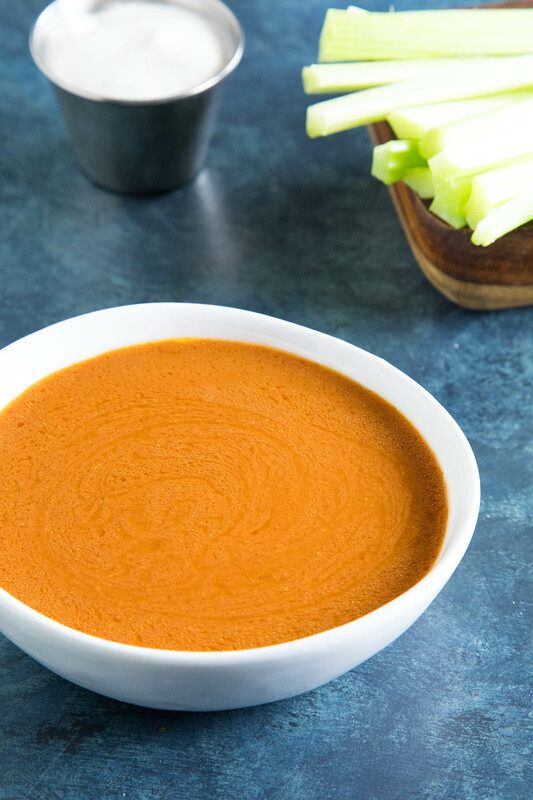 Buffalo sauce tends to be thicker and smoother than hot sauce. It’s more silky in texture from the butter addition. Richer, too. Some of them that you get from the store will use oil instead of butter. This is why this homemade Buffalo sauce recipe is so much better. Whisk in that butter, my friends! And other ingredients, of course. For the flavor. Most people consider it a buffalo wing sauce only, though you can use it to spice up many different foods. Try buffalo chicken dip. OPTIONAL: Pinch of ghost pepper flakes for XTRA HOT! Or try Cayenne Flakes for a nice level heat. I love hot peppers. Obvi. 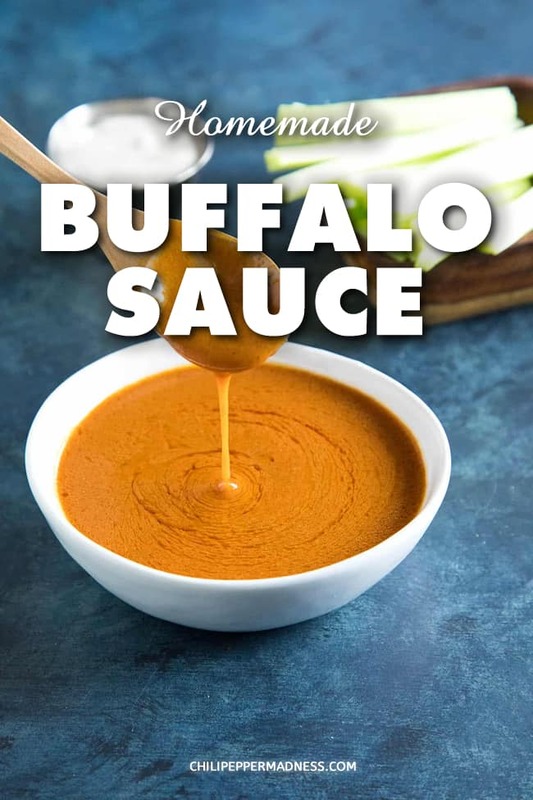 Of course you CAN make your own homemade Buffalo sauce with only 4 ingredients, as many recipes like to push – butter, hot sauce, vinegar, Worcestershire – and it’s pretty good in a pinch, but the extra ingredients here make a big different in the overall flavor. Heck, you could really make a 2-ingredient sauce – hot sauce and butter – if you wanted. I go with the extra ingredients. First, melt the butter in a small pot over low to medium heat. Next, whisk in a good Louisiana style hot sauce along with vinegar, Worcestershire sauce, Tabasco, paprika, garlic and salt and pepper, until the sauce is nice and smooth. Finally, cool slightly, then store in an airtight container in the fridge or use it right away. Wings, wings, wings! Check out my chicken wings recipes. Top off your nachos and tacos for extra zing! For the Louisiana style hot sauce, Franks red hot sauce is traditionally used, though I personally prefer Valentina Hot Sauce. It’s much cheaper for one, but I enjoy the flavor for certain sauce starters, like this one. It’s just perfect for this. Or hey, make your own. See my post: Homemade Louisiana Hot Sauce Recipe. You’re typical Buffalo sauce is made up of hot sauce, butter and maybe a bit of vinegar for tang. This version ROCKS. Give it a try. What’s your favorite food for using Buffalo Sauce? There are so many! Is it Buffalo wings? Let me know how it turns out for you! – Mike H.
OPTIONAL: Pinch of ghost pepper flakes for XTRA HOT! Or try Cayenne Flakes for nice hot. Melt the butter in a small pot over low heat. Add the remaining ingredients and whisk them together until nice and smooth. Cool, then transfer to an airtight container and refrigerate. Makes a bit more than a cup. Heat Level: Medium. It's quite tangy. These days I like to make my Buffalo sauce more exciting by garlic powder before I heat it up (to melt the butter) and afterwords adding blue cheese crumbles and a blue cheese dip (50% of volume of the butter & hot sauce). Sounds like a great variation for sure! Nice!